An Internet marketing summit featuring the best talent from the Chicago and Milwaukee areas, and which focuses particularly on search marketing and social media, is poised to become one of the most talked-about events in Wisconsin this February. Dubbed “Think Tank Live!”, the summit brings together several of the most dynamic and talented Internet marketers this side of America, as well as C-level executives, small and medium-size business owners, top branding and communications professionals, and IT and web design experts. 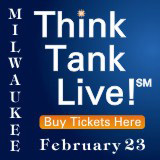 “Think Tank Live” will be held February 23 at Country Springs Hotel, Waukesha, WI. Sponsored by Biz Times Media and Mashable and organized by I.M. Think Tank (a collective group of integrated marketing professionals in Chicago and Milwaukee areas), the summit will focus on educating people on utilizing today’s best Internet marketing and social media practices to strategically drive business results, increase profits, and lower costs. “Think Tank Live!” will have a track on Internet marketing strategies that align businesses for the increasing number of customers on the Web. With resources and speakers from today’s top talents and experts in digital marketing, search and social media, and online advertising, “Think Tank Live” is poised to deliver high-level insights crucial in achieving real-world results for businesses of all sizes. Topics in the summit include: digital marketing strategies; search engine optimization (SEO); pay-per-click advertising; social media; website analytics; website design; online reputation management; and WordPress blogging. Emerging best practices in today’s dynamically evolving Internet marketing industry will also be shared in the summit. Chris heads the team of Internet marketing agency Lakeshore Branding, which delivers flexible website design, social media, SEO, eCommerce, and Web 2.0 solutions to clients, individuals, professional organizations, and small businesses. A marketing consultant who has worked for brands like Dell, Gortex, Jamba Juice, Cartridge World, and the Chicago Bears, Chris is one of Illinois’ most dynamic young entrepreneurs. Apart from being a founding member of I.M. Think Tank, Mary also holds the position of Director of Marketing for ExPrT Exhibits, Graphics, and Signs in Chicago. She is professionally engaged with Integrated Marketing, Internet Strategies, SEO, Social Media, and Live Events. In his work as a search engine marketing expert, David has been quoted in the Wall Street Journal, was deemed “web-savvy” by Michael Arrington of TechCrunch, contributes to Search Engine Watch and is a frequent guest author, conference speaker, and quotation source in the Web for SEM- and SEO-related topics. After productive stints at technology-intensive investment firm BlackRock and Alliance Bernstein, David now helps organizations integrate Internet marketing strategies to improve profitability. James owns Marshal Firth, a company that offers a variety of Internet marketing services. Experienced in expanding companies’ online presence as well as maximizing revenue through affiliate marketing, James holds a bachelor’s degree in Network Technologies from DePaul University. Chris works as an SEO and Web Analytics Specialist at Agency.com and develops comprehensive natural search programs that are backed by sound strategy and web analytics reporting. An Advertising/ Marketing degree holder from Marquette University, Chris has worked for clients such as Nike, Hewlett-Packard, Skittles, Vonage, Aon and Jones Lang LaSalle. Ryan is Founder and President of Rand Media Group, which creates and manages custom online marketing programs for mid-sized companies. He previously worked in investment banking and consulting, after which he made an early foray into the digital world as an employee at one of the largest tech startups in Chicago. Lisa is a creative designer and the owner of E.Webscapes Design Studio, which provides custom solutions for web site owners using different content management platforms. She also wrote the official WordPress For Dummies book, the first edition of which was originally published in 2007, with the second edition published in 2009. Mert is a veteran Internet Marketing Consultant who has done extensive interactive marketing work for small businesses & global Fortune 500 corporations. Also an entrepreneur, Mert holds a Chicago Real Estate Licence and is a partner at Falcon Living, a Chicago Real Estate Brokerage with his brothers. With over fifteen years of sales and marketing experience, Jo works with small- and mid-sized businesses with a specific emphasis on B to B lead generation. A certified Google adwords professional, she also currently leads the Pay-Per-Click Marketing department at Top Floor Technologies. Known at-large as “Milwaukee SEO”, a long-time nickname, Tony has worked on search engine optimization and search marketing projects for several large verticals on international, national, and local levels. He also recently started a new endeavor, Silver Arc Search Marketing, working to help small business owners with their search marketing strategies. Seng is a sales and marketing consultant with more than ten years of experience in integrated marketing, business development, and account management. She has managed relationships and projects for Fortune 500 companies headquartered in the Chicago area and New York. Seng graduated from DePaul University with a M.A. in Leadership in 2005 and a B.A. in Advertising and Public Relations in 1998. “Think Tank Live!” promises to offer attendees the best practices and most innovative strategies that would make all the difference in online marketing. To register, you can buy your “Think Tank Live!” tickets here. You can take advantage of our discount code “CCThink50” for $50 off!